It’s a pretty widely circulated fact that the immigration process in the United States is a slow one. It can take months to get approval for a temporary visa or to gain a Green Card. Anyone wanting to become a naturalized citizen is looking at a wait that will take literal years. And that was wait times before the government shut down just before Christmas. The President initiated the government shutdown over the ongoing debate over building a wall on the border between the United States and Mexico. The issue boils down to whether or not to actually build a physical wall across the entire border — and more importantly, how to fund that endeavor. When the presidential administration couldn’t reach an agreement with Congress about 2019’s national funding back in September, that triggered the process for a continuing funding resolution. When they still couldn’t reach an agreement, that initiated the shutdown. That last department should cause concern for anyone with an open immigration application, or anyone seeking to apply for immigration status in the near future. The Department of Homeland Security is responsible for, among other things, verifying a person’s immigration status for employment. The Department of Homeland Security also includes U.S. Customs and Border Protection, U.S. Citizenship and Immigration Services, and U.S. Immigration and Customs Enforcement. As you may imagine, this means the government shutdown isn’t just affecting employee pay — it’s also impacting the immigration process as a whole. Even before the shutdown, there was a huge backlog of immigration cases that needed to be processed. In part, this is because the number of immigration requests has skyrocketed in the last five years. According to NPR, the White House recently “asked Congress to fund 75 new immigration judges to help clear overcrowded dockets” because the number of cases to process has grown so large. And, of course, that request was made before the shutdown affected things further. An estimated 100,000 immigration hearings will be postponed because of the shutdown. This includes a list of people who have likely already been waiting months or years for the hearing to take place, who have already started working with an immigration lawyer, and potentially have even traveled for their hearing. Since there was already a backlog of more than 800,000 cases, this is going to slow down the immigration process even more. According to the NPR article quoted above, some immigrants may be waiting until 2022 for their rescheduled hearings to finally take place. Detainee cases are still being heard despite the shutdown. 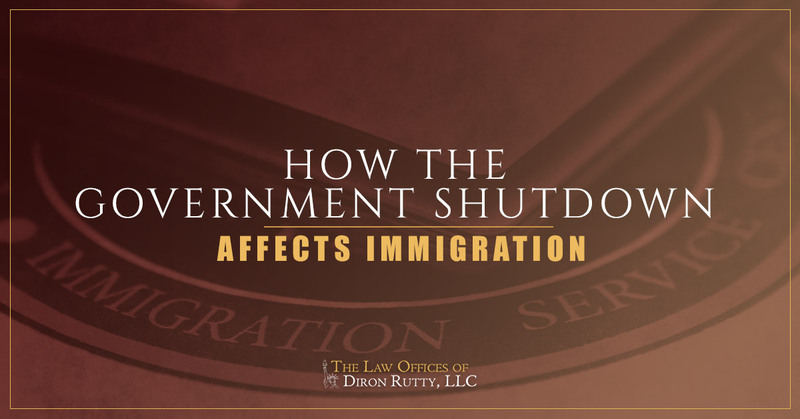 The number of cases being heard will vary from state to state depending on the type of case, so some states are fully shut down to immigration hearings and others are continuing to operate on a restricted basis. If an immigrant’s court date is canceled/postponed, they will be notified accordingly. The government shutdown means somewhere around 90 percent of immigration cases are now delayed until the shutdown is over. Figuring out what to do can be tough, so don’t go it alone. Connect with an immigration lawyer for help figuring out what to do about a delayed immigration hearing as well as any other immigration help you may need. Every immigration case is different, so working with an immigration lawyer can make a difference. Contact the Law Offices of Diron Rutty, LLC. to work with an immigration lawyer in the Bronx and across New York City.